Gospodi is such a CD. In my view it is a genuine masterpiece. The title piece itself, „Gospodi“, transports the listener into a spiritual trance, into a state of meditation. Deep chants of the Russian word „Gospodi“ (literally „Lord in Russian) usher us into the ancient-sounding space of the opening track, „Gospodi-I Am in the Light“. The chant is a central prayer of the Russian Orthodox Church, but these overlapping vocal drones mingle with the sounds of far distant religious traditions too. An Indian singer colors the keyboard drone with vocal curlicues, intertwining with a sensual sarangi and sufi drums bring a slow pulse to the track, bringing our heartbeats in sync with the liturgical headspace that Woschek and Co. have created. This is more than music. It is access to a realm of light and sound. The Jesus Christ of Gospodi: The Light of Christ isn‘t the flaxen-haired martyr of Sunday schools and cathedral walls. He is not really a historical figure at all. 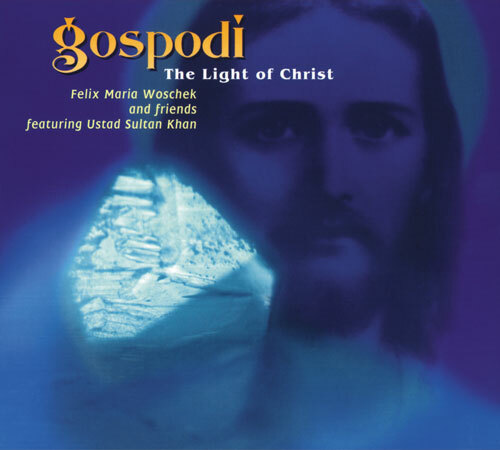 In the musical Eden of Gospodi: The Light of Christ, German New Age musician & composer Felix Maria Woschek envisions Jesus as the embodiment of many ideals, the essence of teachings that resonate with many of the world‚s great spiritual traditions. You can hear Woschek‘s years of travel and study in the way that Gospodi filters Christian liturgy through multiple cultural lenses, like afternoon light streaming through the stained-glass window of a church. Woschek‘s point is that it‘s all the same light. Jesus preached unity and healing, concepts enshrined in eastern and western religions for millennia. Deep chants of the Russian word „Gospodi“ (literally „Lord“ in Russian) usher us into the ancient-sounding space of the opening track, „Gospodi I Am in the Light.“ The chant is a central prayer of the Russian Orthodox Church, but these overlapping vocal drones mingle with the sounds of far distant religious traditions too. An Indian singer colors the keyboard drone with vocal curlicues, intertwining with a sensual sarangi; eleven minutes in, and sufi drums bring a slow pulse to the track, bringing our heartbeats in sync with the liturgical headspace that Woschek and Co. have created. While the entire piece is 33 minutes, it could last forever. This is more than music. It is access to a realm of light and sound. „Hallelujah The Light Is in Me“ immerses the Hebrew mantra of the title into a backdrop of Celtic flute and hammer dulcimer. Messages of „May peace prevail on earth“ ride in and out among resonant chanting. It‘s a simple expression of well-wishing, even more powerful for its multicultural thrust. But Gospodi‘s light is nowhere more directly felt than on the closing „Kyrie I Am the Light“. We are swallowed by its droning tonalities, dazzled by the light of its sarangi, hammer dulcimer, and soprano saxophone textures. By the end of the track‘s 22 minutes something transformative happens. As the spiritually imbued music pours into us, we in turn pour into the music, becoming one with it. That oneness with the divine spirit is an essential trope of Hinduism, Buddhism, Judaism, and, indeed, Christianity. It‘s one that Woschek helps us learn through music. The most distinctive singer of the New Age and his friends have produced a new masterpiece of modern spiritual song culture. The focal point of these acoustically recorded compositions is the traditional mantras of the Christian liturgy combined with the concepts of oriental music. The successful combination of occidental and oriental musical traditions makes the idea of a global spiritual concept appear to be a real possibility.